1. Brown Dog Ice Cream– The great thing about Brown Dog is that it’s named after “Foster” the brown dog. Miriam, the owner, makes fresh, unique flavors every week. Last week’s flavor was Monkey Business, the trifecta of ice cream—chocolate and peanut butter swirled into banana ice cream. Miriam often uses seasonal local ingredients as they become plentiful. A summer day is not complete without a stroll, or in our case a golf cart ride on “Cheesy Bay,” for a refreshing treat at Brown Dog Ice Cream. 2. Take in a beautiful sunset with your toes in the sand. In Cape Charles, you always know what time of day it is when you see everyone stopping what they are doing and heading west toward the beach to get a glimpse of that magical fireball getting ready to take a dip in the Chesapeake Bay. Jim and I stop in the middle of whatever we are doing and hop on the golf cart to get our toes in the sand. With cool beverages in hand, we always enjoy those warm glows that begin to light the sky. Our tip: Stick around for five minutes AFTER the sunset…that is when the sky is like an artist has taken a paintbrush to the sky and created a beautifully unique masterpiece. 3. Explore the Wildlife Refuge or Kiptopeke State Park– The Eastern Shore of Virginia Wildlife Refuge offers a ½-mile interpretive wildlife trial, while Kiptopeke State Park provides 5.1 miles of hiking and biking trails for your enjoyment along with recreational access to the Chesapeake Bay. Grab your walking shoes, a good buddy, and a camera, and snap some photos of the great outdoors and the animals who make their home there. 4. Enjoy a historic walking tour– “Cape Charles, a town of diverse neighborhoods and building styles, has many excellent examples of Victorian, Colonial Revival, Craftsman, and Neoclassical styles” (RootsWeb). Step back in time with historic establishments like 515 Mason, the oldest house in Cape Charles, Cape Charles Baptist Church, dating back to 1902, and of course, the Cape Charles Museum and Welcome Center. 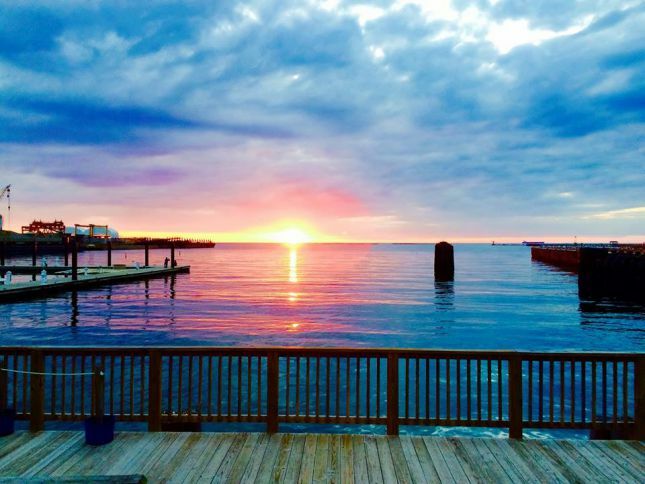 And don’t forget to check out Bay Haven Inn of Cape Charles at 403 Tazewell! Our historic inn is a 1906 Colonial Revival built for James W. and Alyce Wilson as their wedding present from W. B Wilson. Click here for a full list of walking tour destinations. 5. Treat yourself to fish tacos at The Oyster Farm at King’s Creek– While The Oyster Farm at King’s Creek features a large variety of fresh, mouthwatering seafood, their soft tacos are of special note. They’re absolutely delicious! Sink your teeth into grilled, blackened Mahi or shrimp tacos, complete with cilantro, pico de gallo, pepper jack cheese, and homemade coleslaw. Yum!